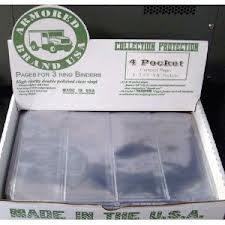 Armored Brand Premium Heavy Duty Pocket Notebook Pages Clear. For use in 3 ring binders. 1/8" Lip for Easier Insertion & Removal than the "thumb cut"
20 Pocket pages feature 8 mil thickness to withstand the weight of more coins.